Pure Land Buddhism signifies a wide array of practices and traditions within Mahāyāna Buddhism directed to the Buddha Amitābha (Amitāyus) and his realm, Sukhāvatī (Land of Bliss), which came to be referred to in Chinese as the Pure Land (jingtu; Japanese, Jōdo). Mahāyāna recognized the existence of innumerable Buddhas and even Bodhisattvas who presided over their own Buddha-fields (Buddha-kṣetra), realms that they had purified or were in the process of purifying. For example, the Akṣobhya-vyūha Sūtra suggests that Akṣobhya and his Buddha-field Abhirati in the Eastern quadrant of the universe achieved a significant status in Mahāyāna’s early period. It is to this tradition, focused on Amitābha and his paradise Sukhāvatī that the term Pure Land Buddhism conventionally applies. the Bodhisattva vocation with its initial set of vows and subsequent accumulation of merit through austerities, the attainment of supreme Enlightenment, and the creation of a Land through stored merit for the salvation of all Sentient Beings. Consequently, the practices affiliated with the Pure Land tradition were reflective of Mahāyāna values and were inextricably embedded within a complex of practice and liturgy that prevailed throughout the Mahāyāna tradition. They too were expected to assiduously follow that Path, rigorously engaging in the requisite spiritual disciplines and austerities, all the while attending to the welfare of all sentient beings. On the other hand, the Pure Land as a place of refuge and liberation was a creation of Amitābha’s beneficent vows to save all sentient beings and as such became a goal for those seeking liberation not through their own effort but through faith in Amitābha’s salvific power. Strengthening this latter view was the belief that grew up in some Mahāyāna circles that the Dharma had entered into an Age of Decline in which the diminished capacities of adherents were no longer adequate to meet the rigorous demands of the traditional Bodhisattva path. Thus, only through easier practices and through Amitābha’s assistance could people hope to attain liberation. an overall examination of Pure Land tradition reveals that both of these seemingly contradictory perspectives have prevailed alongside each other for most of the tradition’s history, and therefore both must be taken into account for a balanced approach to Pure Land developments. The requirement for an evenhanded historical view in Pure Land also necessitates avoiding the facile distinction between monastic and lay practice that associates members of the monastic community with the rigors of the Bodhisattva path and lay adherents with an easier course. Indeed, the very argument for easier practice came from members of the monastic community, while, conversely, we find laics in history emulating liturgical and meditative practices that had monastic origins. Pure Land practice was initially predicated on the aspiration common throughout Mahāyāna to achieve proximity to a Buddha either through a meditative vision or through Rebirth in his Pure Land. as well as from the abiding hope that Liberation could be more easily achieved in the presence and under the tutelage of a Buddha. This goal of seeking access to a Buddha was thought to be best achieved through a practice known as “mindful recollection of the Buddha” (Buddhānusmṛiti), a discipline that had roots in early Buddhism and became a common feature in Mahāyāna scriptures. This meditative discipline most simply refers to the practice of calling to mind and concentrating on the qualities of a Buddha, but in reality it embraces a wide range of contemplative objects and techniques. 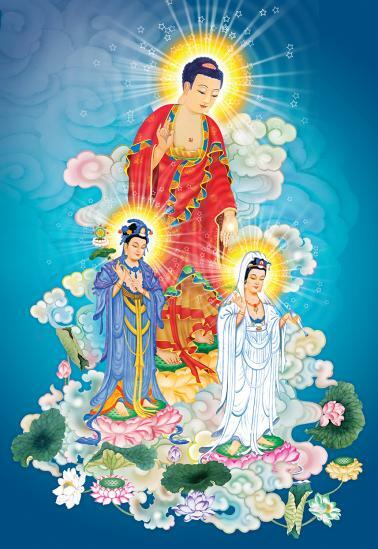 In the Pure Land tradition, the practice sometimes entailed concrete visualization of the Buddha Amitābha, his attendant Bodhisattvas Avalokiteśvara and Mahāsthāmaprāpta, or the Land of Bliss. Then again, in contrast to these tangible visualizations, the practice at other times required a meditation on the formless and empty nature of the Buddha’s ultimate reality, the dharmakāya. Meditative concentration was achieved by such diverse practices as fixing the mind on one or many aspects of the Buddha Amitābha’s appearance, concentrating on the name of the Buddha, or vocally intoning that name through chant or speech. Furthermore, the practitioner could engage in the process through a variety of postures including sitting, standing, walking, or lying down. The practice of Buddhānusmṛiti was accorded a role of central practice in Sūtras that dealt with Amitābha and his Pure Land. An early Mahāyāna scripture, the Pratyutpanna-Samādhi Sūtra, called for an uninterrupted meditation on the Buddha Amitāyus for 7 days and nights, promising that the Buddha would appear before the adherent at the end of that period. The previously mentioned Longer Sukhāvatī-vyūha Sūtra, in presenting the conditions for rebirth, set forth the exclusive recollection of the Buddha of Measureless Life (Amitāyus), if even for 10 moments of thought, as a requirement for all levels of spiritual capacity. Another scripture of non-Indian provenance, the Guan Wuliangshou jing (Contemplation of the Buddha of Limitless Life Sūtra), had as its main content the explication of 13 different visualizations on various attributes of the Buddha and his Pure Land. The Chinese translation of the Sanskrit word Buddhānusmṛiti was nianfo (Japanese, nenbutsu), a term burdened with ambiguity as to the form of practice it denotes. In many contexts, nianfo commonly signifies a mental recollection of a Buddha’s attributes. This discipline was also called nianfo sanmei (the Samādhi of Buddhānusmṛiti), an expression that reinforced a contemplative emphasis by alluding to the meditative trance in which the Buddha would appear. In yet other contexts, the term nianfo came to refer to invoking the Buddha’s name vocally. Despite this seeming contrast, it must be kept in mind that the recitation of the name, whether voiced or silent, chanted or spoken, was originally but one method of several in the mindful recollection of the Buddha. the sectarian traditions of Japanese Pure Land Buddhism, Jōdo shū and Jōdo Shinshū, appealed to a distinction made by the Chinese monk Shandao (613-681), assigning recitation of the name a separate and superior status among the various practices. - a formula that was drawn from the Guan Wuliangshou jing, therefore came to eclipse all other practices within the Pure Land traditions. founded a society of monks and elite gentry in 402 C.E. that adopted the Buddha recollection of the Pratyutpanna-Samādhi Sūtra as its core practice. More than a century later, Zhiyi (538-597), the founder of the Tiantai School, incorporated the same Sūtra’s practice into his 4-fold system of meditative practice. These performances often included preparation of the ritual site, personal purification, offerings of flowers and incense, invitation and invocation of the deities, physical obeisance, confession of sins, and application of merit. that required the practitioner to continuously circumambulate an image of Amitābha in a dedicated hall throughout a period of 90 days, leaving the premises only to attend to bodily functions. Zhiyi’s liturgical and contemplative regimens continued to exert influence on the development of Pure Land in the Tiantai School in China, as well as its Japanese counterpart, the Tendai School. Zhiyi’s 90-day retreat was promoted by such prominent Tang- dynasty (618-907) figures as Chengyuan (712-742) and Fazhao (d. 822), who also created a musically based ritual for the community on Mount Wutai. During the Song dynasty (960-1279), the Tiantai monk Zunshi (964-1032), emulating the liturgical patterns established by Zhiyi, developed a number of rites and practices dedicated to Amitābha and to the achievement of rebirth in his Pure Land. Zunshi’s rituals, which included a longer and a shorter penitential ceremony, came to hold a place of honor in subsequent ritual practice that has survived into the modern era. During the aforementioned historical developments within the Tiantai School, the practice of recollection on Amitābha shifted in focus from the Pratyutpanna-Samādhi Sūtra to emphasis on the Guan Wuliangshou jing. Members of the Tiantai School in the Song dynasty consequently constructed retreats called 16 Visualization Halls that were based on the Guan Wuliangshou jing and consisted of a central hall at the middle of which stood an image of Amitābha. Around this cultic focal point were arranged a series of cells for retreatants dedicated to extended periods of ritual and contemplative practice. Members of the Huayan and Chan traditions also contributed to the understanding of the practice. Common to all these traditions, however, was a hierarchical ranking of the various practices signified by the term nianfo. - following in ascending order. Implicit in this categorization and others like it in other traditions is the notion that what is ultimately apprehended in contemplation is the identity of Buddha and his field with one’s own mind. This identity constituted part of a comprehensive idealistic philosophical system embraced by some members of the Tiantai, Huayan, and Chan traditions. These philosophers saw all reality as ultimately reducible to mind, and in some cases applied this idealistic approach to Pure Land. One of the most famous of such articulations of mind-only Pure Land was that produced by the Chan scholar Yanshou (904-975). Members of the Chan school sometimes adopted this view as the basis of a polemic that argued for the superiority of the goals and practices of Chan over the aspiration to rebirth and its attendant practices found within Pure Land. During the 12-14th centuries, Sukhāvatī figured prominently in visions of Nyingma masters among whom Dam pa Bde gshegs (1122-1192) developed a tantric sādhana for visualizing Amitābha, along with a prayer for rebirth in his land. Later in history this goal was explicitly linked to the attainment of Sukhāvatī. The visualization, which culminates in a dissolving of Amitābha into the adept, is practiced with the belief that it will lead to eventual rebirth in Sukhāvatī. The various meditative disciplines described above have occupied a significant but by no means exclusive position in the tradition of Pure Land practice. Sometimes, general Buddhist merit-gaining activities, such as the strict observance of Precepts, the chanting or copying of scriptures, the commissioning of carved images, and other forms of donative activity, have been imbued with Pure Land significance. Also throughout Mahāyāna traditions are found prayers and, in Vajrayāna, the recitation of Dhāraṇī that seek rebirth for oneself and members of one’s family. More proper to the original Mahāyāna vision, Pure Land practice has often been integrated into the larger context of the Bodhisattva vocation with its concomitant host of activities aimed at the acquisition and transference of merit as well as at the aiding of all sentient beings. such as the building of bridges and the digging of wells, the releasing of living creatures destined for slaughter, the conversion of people from taking of life, the eating of meat, the providing of hostels for travelers, and the burial of the dead. On a more extreme note, some Pure Land adherents undertook the physical austerities (dhūta) enjoined in the Bodhisattva precepts and Mahāyāna scriptures, such as the Lotus Sūtra (Saddharma-Puṇḍarīka Sūtra). Practitioners burnt fingers, limbs, and sometimes even their entire person both as acts of devotion to the Lotus Sūtra and as deeds done in the hope of rebirth in Pure Land. Beyond these acts of Self-Immolation, religious suicide within Pure Land found expression in Kamakura Japan when devotees drowned themselves in expectation of rebirth. The goal of rebirth in the Pure Land made the period directly preceding and that immediately following death a critical time fraught with both danger and opportunity in the determination of one’s future destiny. This resulted in the creation of deathbed and funerary practices that aided the dying and the newly deceased in the attainment of Pure Land. The content of one’s last thoughts were thought to be the crucial factor in determining one’s next rebirth, and thus deathbed rites were designed to assist the dying in forging a karmic link with the Pure Land by fixing their mind on Amitābha. deriving largely from the promise of the Guan Wuliangshou jing that 10 uninterrupted thoughts on the Buddha would lead to rebirth even for those who had accumulated a lifetime of evil karma. Increasingly, this latter practice was interpreted in terms of vocally reciting the Buddha’s name. He or she would be often placed in front of an image of Amitābha and given a cord to hold that was attached to Amitābha’s right hand. This symbolic link portended both the aspirant’s hope for rebirth and the grace and power of the Buddha flowing through the connection. Funeral rites in East Asia and in the Tibetan cultural area have often attended to the theme of rebirth in Sukhāvatī through liturgical expression and prayers. Underpinning deathbed and funeral practices was a promise articulated in Amitābha’s 19th vow that at the moment of death Amitābha and his attendant Bodhisattvas would appear before the devotee. Raigōzu, paintings depicting Amitābha and his retinue descending on a white cloud to meet the dying devotee, became popular during the Heian period. The same period also witnessed the widespread enactment of mukaekō, a ceremony in which the Buddha’s coming was recreated in song and dance accompanied by verbal chanting of the nenbutsu. deathbed and postmortem accounts report apparitions, Dreams, the presence of fragrances or auras at the moment of death, the preservation of the devotee’s body, or the discovery of relics (śarīra) in the ashes of the adherent’s cremated body. The narration of these auspicious signs became a central element in collections of Pure Land biographies that proliferated in China and Japan with the development of Pure Land belief. a perception that was reinforced by the Chinese Pure Land biographical collections of the Song period, which constructed a patriarchal lineage for the tradition. Although the meditative practices enumerated above could be understood as suited for solitary cultivation, it is equally important to emphasize the communal settings in which Pure Land came to flourish. The members of this society took a solemn vow before an image of Amitābha that whoever achieved the Pure Land first would aid those remaining behind in attaining rebirth. This association, which was later named the White Lotus Society, became a paradigm in the formation of societies that proliferated particularly during the Song dynasty. Their membership was drawn not from the elite alone but from a wider societal spectrum, including women and people of the lower classes. The size of these societies was sometimes in the thousands, far exceeding the modest size of Huiyuan’s society. Furthermore, these associations often engaged in practices that did not always explicitly or exclusively address Amitābha and the Pure Land or that differed from the meditative emphasis in Huiyuan’s group. Lastly, some of these societies were founded and led by lay people rather than monks. This is notably the case of the White Lotus movement founded by Mao Ziyuan in the 12th century. The Korean monk Chinul (also called Bojo Jinul) (1158-1210), who is best known for the Koryo period (918-1392) revival of the Son (Chan) tradition, is credited with initiating a movement of religious societies that drew inspiration from the Chinese movement of the same era. and the Tendai monk Genshin (942-1017), renowned for his seminal work on Pure Land, the Essentials of Rebirth, were active in establishing and participating in societies such as the Kangakue (Society for the Advancement of Learning) and the Nijūgozammaie (Samādhi Assembly of 25) that had a Pure Land orientation. Besides regular gatherings in which the name of Amitābha was recited, the Nijūgozammaie also provided support for sick and dying members, adopting many of the deathbed practices discussed above. Perhaps the most famous of these was Kūya (903-972), who proclaimed the vocal recitation of the Buddha’s name from street corners.